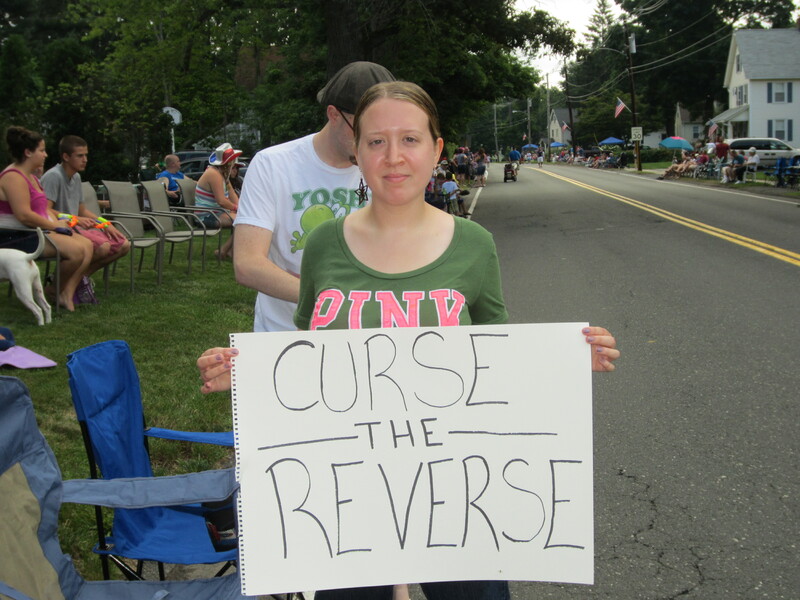 Stephanie Lynn ‘protests’ reversal of East Longmeadow 4th of July Parade Route. Holidays have a rhythm of their own. For us Independence Day involves fireworks the night before, a parade and hosting a party. The fireworks and parade take place in East Longmeadow. Late in the day on the third, we learned the parade route had been reversed. What had been the beginning was now the end and the end, now the beginning. I understand this was big news in ‘E.L.’ for sometime, for those of us living 200-yards over the town line, it was a surprise. After all the timing of our cookout/party was based upon the ending of the parade. After much gnashing of teeth and joking as to what the change would mean, an early exit from the parade? My daughter Stephanie decided to take action! ‘Curse the Reverse’ became the battle cry! We rallied around her handcrafted sign and off to the parade we went. 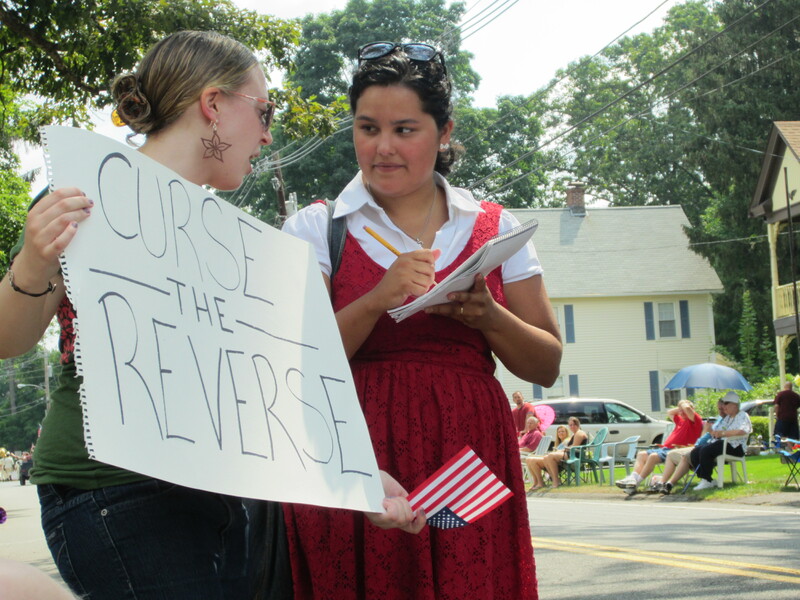 I can’t believe someone held up a sign “curse the reverse”. Wow, get a life Stephanie!! Did you stay and watch the parade or did you leave? Were you on the parade committee and voice your opinion there? Everyone connected with the parade did and always do a wonderful job every year. Happy 4th to you, Stephanie!! I am probably just being her father here, but it strikes me as odd that on the day we celebrate our independence, the day we as a nation declared our people possess unalienable Rights, things like life, Liberty and the pursuit of Happiness , that any individual would come under criticism for an excercise in free speech. While patriotism is now in vogue, the true patriot has the courage to stand-up and be counted. If it gets good natured reactions all the better. Believe it (you have pictures). She has a great life and her mother and I are very proud. We watched the entire parade and it was great! She is away at college, so no parade committee involvement. Yes, the parade committee did do a wonderful job, as usual. Steph had a wonderful 4th, as I hope you did too! Lastly, the fireworks were phenomenal!! Posted on July 5, 2012, in history, Life, news and tagged 4th, East Longmeadow, Independence Day, July, ma, massachusetts, masslive, patriotism, rights, speech, wmass. Bookmark the permalink. Leave a comment.